More than forty winks: who will be hibernating this winter? When the temperature drops and the days grow shorter, many of us feel like climbing into bed and waiting it out. Well, for a lot of animals in New York State, this is exactly what they do. To conserve energy during the season when food sources become scarce, some animals go into an inactive or sleep-like state called hibernation. How and where the animal hibernates, as well as the amount of time it hibernates usually varies by species, but all end hibernation when the warmer spring weather returns. Most mammals will prepare for hibernation by spending the months leading to winter gorging themselves and building up their fat stores. To these animals, every day is Thanksgiving when they are getting ready to hibernate. Once the animals sense shorter days, colder temperatures, and less food, it knows that hibernation should soon begin. When most people think of an animal hibernating, they think of a bear curled up asleep in its den all winter long. While bears do hibernate, they are not the only animals that spend their winter this way. Many other mammals, including reptiles, amphibians and even insects hibernate the winter months away. Cold-blooded amphibians and reptiles hibernate differently than warm-blooded animals. Instead of sleeping the months away, they will enter a state of suspended animation sometimes called brumation. Animals that are in brumation are actually semi-conscious and have no control over their body temperature. Snakes, turtles, and frogs will undergo brumation in burrows, mud or underwater anywhere the temperature might be above freezing for them to survive. Often times they will borrow themselves so far they are below the frost line. Some frogs cannot hide from winter’s cold; they hibernate under rocks and logs and may freeze during the cold winter days. Natural chemicals and processes in the animal’s blood prevent them from freezing. The animal’s body produces an “anti-freeze” (a cryoprotectant) as the temperature begins to drop; the animal’s body concentrates sugars and other compounds that prevent the animal’s organs from freezing. The antifreeze prevents the animal’s organs from freezing. A frozen animal will stop breathing and the heart will stop beating. Most of the fluid in the blood pools in the animal’s body cavity. Learn more about freezing frogs in a previous blog. Some insects known for hibernating are the Mourning cloak butterflies and Woolly bear caterpillars. One of the first species you see when spring is on its way, the Mourning cloak butterfly, spends the winter months frozen but alive usually under loose tree bark. One of the most recognizable insects, the woolly bear caterpillar can spend its winters frozen as well. These insects also survive freezing by producing a cryoprotectant that shields their tissues from being damaged by the freezing temperatures. One mammal that does not hibernate is humans, so make sure to get out and enjoy all the beauty New York State Parks has to offer this winter! “Ever since I was young, the story about bears was always the same. Bears hibernated all winter long, usually in a cave and would emerge in the spring. I have since learned a bit more about the environment and ecology and have found that there is much more to the story,” said State Parks staff member Patty Wakefield-Brown. Hibernation occurs when an animal’s body temperature drops and its breathing and heart rate slows, thus lowering the metabolism of the animal, and conserving the animal’s energy. Bears are not “true” hibernators. They sleep for long periods of time but are easily awakened and, if the winter is mild, bears may wake to eat. This behavior is termed torpor, a state or inactivity achieved primarily by a greatly lowered (reduced) body temperature for hours, days or months. Only woodchucks, jumping mice, and cave bats are the “true” mammal hibernators in New York State. Taking a long winter nap when food is scarce and weather is bad is a great adaptation for bears. While in a state of torpor, a bear will not urinate or defecate in the den. Their bodies absorb the urea and turn it into protein, which is needed during the long winter months. During hibernation, female bears (sows) give birth and nurse their cubs. Females have delayed implantation, meaning that the egg is not implanted in the uterus unless the female bear has the energy, weight, or does not have the physical requirements to provide for the cubs during pregnancy and just after birth, the egg is released and there is no pregnancy. That is amazing. While in the den, sows wake up in January or February to give birth, generally 2-3 cubs. Black bear cubs are born altricial, which means helpless, hairless, and blind. Cubs remain with the mother for a year and a half or more before they disperse or she forces them out. Bears generally emerge from their dens in late March and early April and are primarily interested in two things; eating and reproducing. Mating occurs in May or June. Males and females are sexually mature at around four years of age. With the human population increasing and more and more land being transformed to accommodate this increase, the natural habitat of the American Black Bear is being minimized. Because of this, there is a greater likelihood that a person will have an encounter with a black bear. Wildlife biologists collar and collect data from bears to learn about their populations, home range, health and preferences for den sites. Like all wildlife that we share our environments with, keeping track of this data helps to create local and regional management plans. “While a college student, I took a two- semester black bear management class. We worked with the New York State Department of Environmental Conservation (DEC) to assist in the creation of a database regarding den site criteria. We were able to accompany DEC staff on bear den visits in mid-March and collect data about the bears. The bears were outfitted with telemetry collars which enabled them to be found when they were in their dens during the winter months,” noted Patty Wakefield-Brown. ‘Photo 1’ below shows the DEC staff gently removing the tranquilized bear from the den; the entrance was on quite a steep slope. Photo 1, by Patty Wakefield-Brown. The bear was a female that had been previously collared. The purpose of the den visit was to change collars and to collect data including weight, visual appearance, take blood samples and note whether any cubs are present. DEC staff also inspected the den, described its location, (i.e. old log, brush/thicket, hillside, under porch, etc. ), took measurements of the den’s interior, what materials den was comprised of, and the amount of cover, and noted the den’s proximity to humans, houses, and roads. “On this day there were three cubs in the den with the sow. As the mom was being ‘processed’ we got to hold the cubs to determine their age. The way to age young cubs was to measure the hair on the tops of their heads (between their ears) or inside their ears, from the tragus to the tip of the ear (Photo 2) (Bridges et al. 2002). When all the data was collected, the mom was placed back into the den comfortably with her cubs (Photo 3)” recalled Patty Wakefield-Brown. Photo 3, by Patty Wakefield-Brown. When bears disperse, they sometimes wander into populated areas creating human-bear conflicts. That was the case in October 2010, when a young male bear wander onto the Rochester Institute for Technology campus in Henrietta. The DEC natural resource managers ‘captured’ the bear and took him to a facility to collect data on him before he was relocated (Photo 4). The bear management class was invited to observe the event. After the bear was tranquilized, a patch was put over the bear’s eyes, so that they don’t dry out (the bears don’t blink when anesthetized). Blood samples were taken, ears were are tagged and a tooth was taken to age the bear, also the inside of the lip was ‘tattooed’ with a number and a radio collar was placed on the bear (Photo 5).The process was done very methodically and quickly. The bear was then released into the Hi-Tor Wilderness Area. Photo 4, by Patty Wakefield-Brown. Photo 5, by Patty Wakefield-Brown. Winter slumbering bears are an essential part of the the ecosystems found in New York State parks. They are part of the splendor of the natural world that mesmerizes us and holds us captive in its magic. If you are lucky, you might get a chance to capture some of that magic if you see a bear in a New York State Park next summer. Post and photos by Patty Wakefield-Brown, OPRHP. Bridges, A.S., Olfenbuttel, C Vaughan, M.R. (2002). 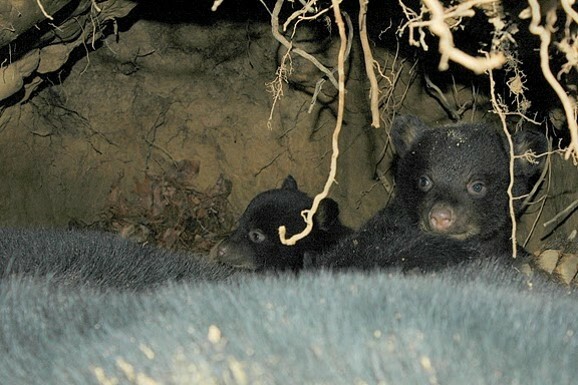 A Mixed Regression Model to Estimate Neonatal Black Bear Cub Age . Wildlife Society Bulletin, Vol. 30, No. 4.